Situated within the Three Valleys, and in easy reaching distance from Méribel and beyond, Courchevel 1850 (or just Courchevel as it’s now been renamed) provides access to the world’s largest ski area. Courchevel 1850 is one of five villages that make up the resort of Courchevel. The others are Courchevel 1650 (Moriond), Courchevel 1550 (Courchevel Village), Le Praz and La Tania. Courchevel is one of the premier French ski resorts, popular with holidaymakers from around the globe. Courchevel 1850 itself has become known as the playground for the rich and famous and has become increasingly popular with Russians in recent years. As such is an amazing place for people watching and to spoil yourself. With an impressive 12 Michelin stars, it’s a firm foodies favourite. And there’s enough fur in 1850 to cloth a small nation and handbags dogs aplenty. Plus, if you keep your eyes peeled you might spot a familiar face with the Beckhams or Will and Kate, among other famous fans of the resort. All these things aside, Courchevel 1850 is ideally placed with excellent links to the Three Valleys for you to get out, explore and make the most of your holiday. Find the lesson that suits you at our Courchevel 1850 Ski School. 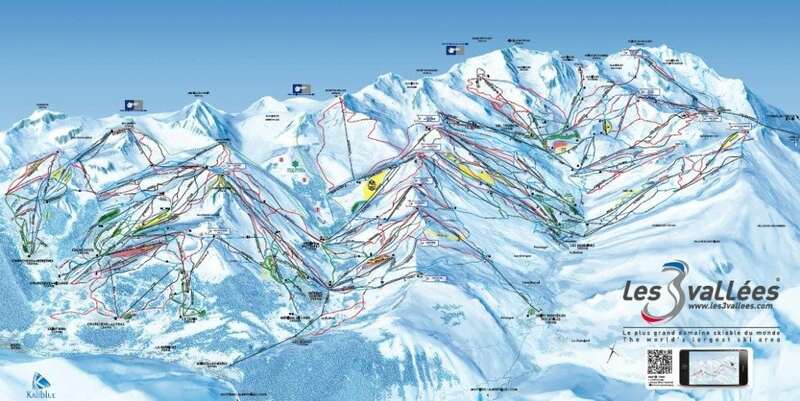 Click on the images for high res downloadable piste maps of Courchevel and The Three Valleys. The best ski runs in Courchevel 1850 – our pick of the bunch. Courchevel is part of the world’s largest ski area known as the Three Valleys. There are 150km of runs in Courchevel alone and once you add in those in neighbouring Meribel, Val Thorens, Les Menuires and St Martin you have over 600km of pistes to ski. More than enough to keep you going for a winter, let alone a week’s holiday! As well as the variety of pisted runs on offer there are a number of snow parks to explore and avalanche safety camps to test your skills, as well as some incredible off piste to keep the biggest powder hounds grinning all week. Jardin Alpin bubble – There’s an excellent beginner area at the top with its own magic carpet lift. This is ideal for those first few days on skis or a board. Verdons bubble – Enjoy the wide and gentle green run right through the center of 1850. 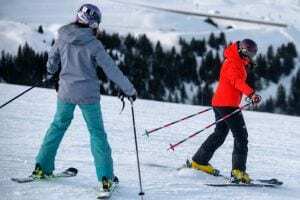 Why Courchevel 1850 is one of the best ski resorts for beginners. Biollay and Pralong – There is a great mix of blues and gentle reds in this area. Creux – The most lovely, long blue run that runs from the top of Courchevel, just where you can drop over to Méribel. Folyeres – If you venture further afield you’ve got a cracking blue run which takes you down to La Tania through the trees. Follow us along as we cruise the blues in Courchevel. Saulire – There are 8 black runs which run down from the top of Saulire and dotted around the resort, so there’s plenty to get your legs working before lunch! Grand Couloir – For those looking for a real challenge. Suisse – Keep your eyes peeled on the grooming report because this run is great when it’s freshly groomed to get the wind in your hair! 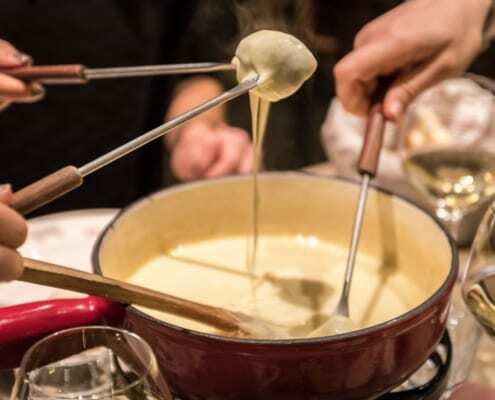 Courchevel is well renowned as a foodies paradise and rightly so. With 12 Michelin stars to its name and options to suit all budgets, there’s something for everyone. You just need to know where to look! Le Forum – You can find a bakery which serves sandwiches, paninis, croque-monsieurs, and pastries. Jack’s Burger – Also located inside Le Forum, Jack’s has a delicious selection of burgers for around 9-15€ each. 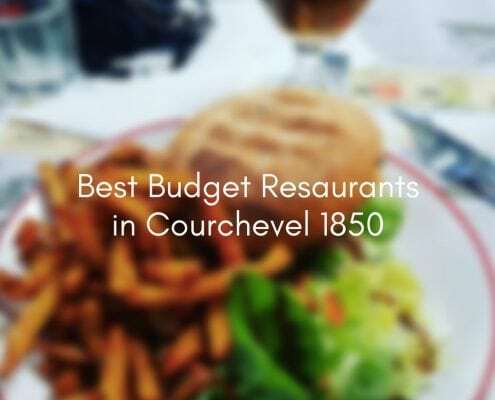 Check out more spots where you can eat on a budget in Courchevel 1850. 9-9 – A good mixture of pastas, meat, and fish dishes along with a kids menu option. Mains range from 13-18€. Chez Gaston – Just at the side of the piste is a great place to grab a burger for 17-19€ or fries in the sun. They also have the typical Savoyard fare as well as good selection of meats and fish dishes. The Chabotte – Situated inside the Hotel Chabichou, this is the bistro restaurant to the Michelin-starred Chabichou. They do a reasonably priced 3-course menu for 29€ and if you go on Wednesday they have live music, so be sure to book. Le Chabichou – This 2 Michelin star restaurant obviously has a bit higher prices, but this gourmet menu will not disappoint. La Soucoupe – One of the best places to get a cote de boeuf on the mountain. Definitely book your table in advance for a lunch here, but then enjoy the views and your food! Le 1947 at Cheval Blanc – Boasting an impressive 3 Michelin stars, if you’re looking to have an unforgettable experience (and admittedly splurge!) this is your spot. 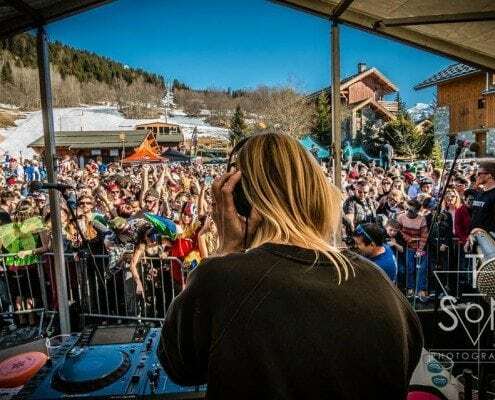 Courchevel has some flashy nightlife if you’re looking for a big night out, but you can find some more low key places to have a drink as well. Chez Gaston – Perfect if you’re looking for a beer on the slopes before you head home. Located just as you ski under the bridge to the right of Chenus bubble, is a fun bar that gets sun in the afternoon and has bands on in the evenings and late night. La Folie Douce – Hands down, a not-to-be-missed après experience on the mountain. Situated on the Mountain between Meribel & Courchevel, this place parties every day until the lifts shut. With dancers, singers, DJs, and musicians dancing on the tables & bars it is an experience not to be missed. Just watch out for the champagne showers! Get there early to make sure you get your own table to dance on. Le Tremplin – A bit more low key, just at the bottom of piste next to La Croisette, this place has a nice terrace in the sun and often have live music at 4pm. La Grange or Les Caves de Courchevel – The places to go for a big night out. DJs, bottle service, dancers and more – these places get wild. During the 1930’s the French government were looking for a spot to build a super ski resort in order to compete with those in Switzerland. But with the war, things were postponed. In 1943, Laurent Chappis had the idea to build a ski resort here and link St Bon (the original center of the area) with the Les Allues valley (Meribel) and Belleville (Les Menuires and Val Thorens). St Bon already had a small tourist industry, with Hotel Lac Bleu (which still stands today) opened in the summer of 1908 and for a winter season in 1925. There were a few extra keen skiers back in those days who had to hike up to get a run down. 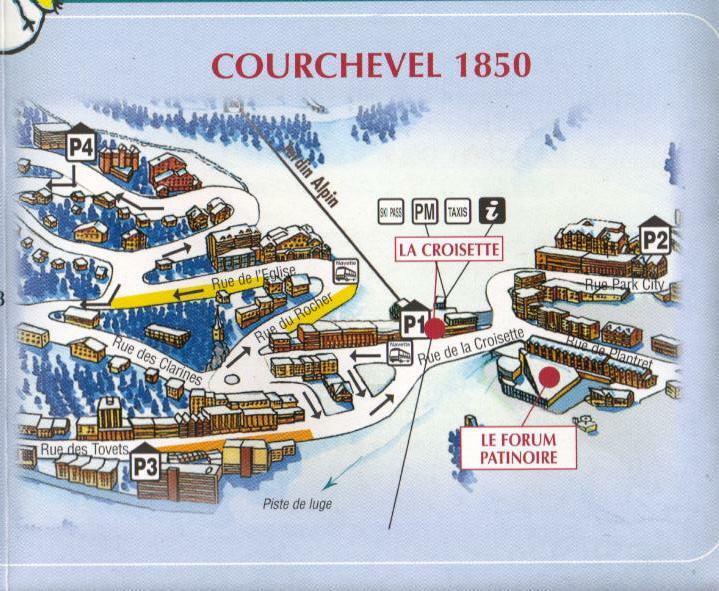 The Courchevel name was the original name of what is now Courchevel 1550. Thus requiring the villages to be named by elevation. Although Courchevel 1850 only sits at 1747m…they merely named it 1850 to compete with Val d’Isere which stood at 1800m! In 1964 they three Courchevel villages decided to come together and operate as one unit, with the control being with the council of St Bon – as it still is today. By 1973 the whole of the three valleys was linked, and still remains the largest connected ski area in the world. There are buses from the airport but you will need to change at Moutiers and they’re not cheap so if there is a few of you it often cheaper to share a transfer. The train is the cheapest option from the airports but again this will involve several changes and the trains are somewhat infrequent. It’s about a 9hr drive once in France to reach Courchevel. The benefits of driving are no luggage restrictions and the option of an extra day skiing during a week’s holiday but the tolls can be quite pricey on the motorways so something to consider. The Eurostar offers overnight trains direct from London St Pancras to Moutiers (about 25mins from Courchevel, at the foot of the mountain). If you don’t mind overnight travel and can sleep on trains (or are willing to forego sleep) then this can be one of the cheapest and most convenient ways to reach the Alps. Plus, no extra charge for ski carriage. You just need to be able to carry all you can bring….. The famous tour operator with affordable options in Courchevel 1850. Three lovely chalets located in Le Praz (Courchevel) with easy access to the bubble up to Courchevel 1850. 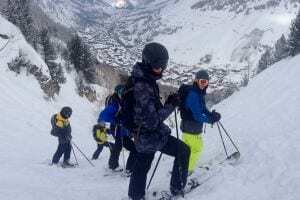 Quality, affordable snowboarding holidays in Courchevel Le Praz since 1997. An independent, family-run company specializing in catered chalet holidays in Courchevel and La Tania. 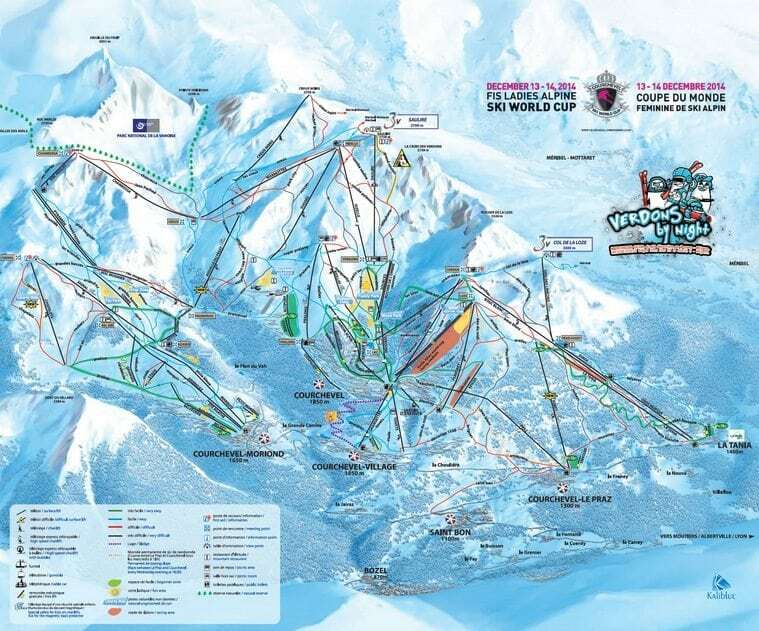 How easy is is to get around Courchevel? There is a regular free bus service in Courchevel which links all the villages. You can get from Courchevel 1850 to 1650 every 10mins during the day and buses run down to 1550 and Le Praz every 30mins. Bus timetables are displayed at each bus stop. And buses run until about 1.30am. Opposite the tourist office and slightly up the hill. If you’re considering buying your own ski boots (a worthwhile and wise investment for comfort and performance) then pop in for a free assessment to the shop in Courchevel 1650. Each boot fit is conducted by a boot fitting specialist, comes with a through free assessment and a comfort guarantee. These can be accessed on the Courchevel website. Where can I find more information about Courchevel? Great magazine site managed and written by Three Valleys locals with insider tips and hints on where to ski, eat and drink, and lots more. The official site for Courchevel. Sherpa – Small supermarket conveniently located inside Le Forum. Carrefour Montagne – Located on your left as you’re driving into 1850. Bakery – You’ll find Pain D’Atan bakery on the road up into the center. The town is dotted with Ski Shops, furniture shops, clothing and more. If you want to take a peek into those high-end shops – I’m talking Louis Vuitton, Prada, Cartier – these shops are just at the foot off the slope. If you’re looking for something a bit more reasonable, head into Le Forum. In there you’ll find a few more reasonable priced ski and snowboard shops as well as a backcountry-focused store, clothing shops, jewelry, and more. What services are available in Courchevel 1850? Doctors – Head to the main medical center, just as you come into the village it will be on your right. Pharmacy – The pharmacy is located on the street to the right of La Croisette as you ski down. Banks – There are two banks Bank de Savoie and Credit Agricole located inside La Croisette. Tabac (Newsagents) – Located just inside Le Forum. Post Office – Full service post office located inside La Croisette. 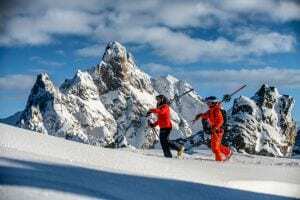 What non-skiing activities are there in Courchevel? Whether you’re a non-skier or have one in your party, or you’re looking for something to do when the weather draws in, there’s plenty of non-skiing activities to keep you entertained in Courchevel. Ice skating, bowling and climbing wall – All located within Le Forum. Spas – There are a handful of spas in various resorts in Courchevel, however, we recommend the Chabichou day pass for great value for money. Aquamotion – The all-singing, all-dancing aquatic centre opened recently and boats a number of swimming pools, diving boards, slides, a spa, and more. Guided snowshoe walks – Get off-the-beaten-track and discover the “real mountains” with Mark Tennent at Simply Savoie. T4 offer a private nanny service in Val d’Isere, Tignes, Meribel, Courchevel, La Tania, La Plagne and La Rosiere. They hand pick nannies who share the belief that undivided attention, fun and getting involved are the key ingredients to a happy family holiday. SnowBugs Nannies offer a high quality, friendly, trustworthy and professional private Nanny service in La Tania, entertaining your little ones in the comfort of your own accommodation during your winter holiday.